From AKIN Original Podcasts, to Musical and Artists Highlights, all for your listening pleasures. "Think about that one person. I don't even have to say who specifically, because you'll automatically think of them. Their name is on the tip of your tongue and their face is etched in your mind, you see them even when you close your eyes. And while years have passed, the hurt and aftermath of it all is long gone. You catch yourself just smiling and nodding, maybe you laugh a little too. It's less of a hysterical laugh and more of a singular breath that's a mix of a "Ha" and a "Huh." Whoever it is for you, is for you. But for me? It was her." Dash American is back & we are playing the Dating Game! We brought some guests in to chat about their dating experiences & how culture and race comes into conversation. Featuring Dan Foster, Charlie Hurtt, & Kiki Kish, We go from #relationshipgoals, to fetishization, to meeting the family. This episode contains some sexually explicit content. 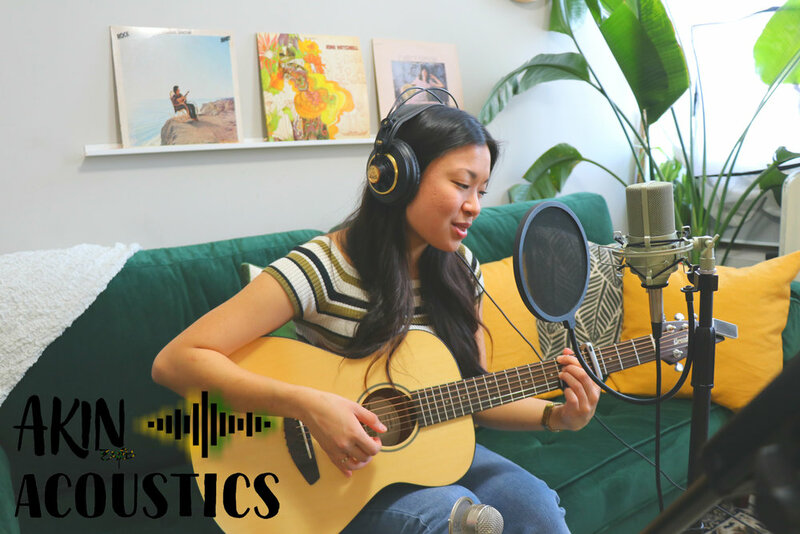 Some of the team at AKIN got the amazing opportunity to sit down with singer-songwriter, Martina San Diego, & have her lay down some exclusive tunes right here at AKIN! Listen to her perform the title tracks of her last two EPs, as well as her first recorded cover in over a year! You can check her out on all major streaming services as well as Martina's Website to find out where to buy her first EP "Blank Walls" and current EP "Illuminate". These sounds are brought to you by our friends at Vaulted Arts. Meet some of the members of AKIN: Ruthie Ofrasio, Hubert Silva, Sam Midwinter, and AKIN partner from "Vaulted" Noah Breymeier, as they share stories of their identity, discuss their relationships to their identities, as AKIN's goal to bring together an audience and a community of underrepresented artists of color. Featuring musical compositions by Jessi Raymundo.